This year I am making as many handmade Christmas gifts as I can manage. 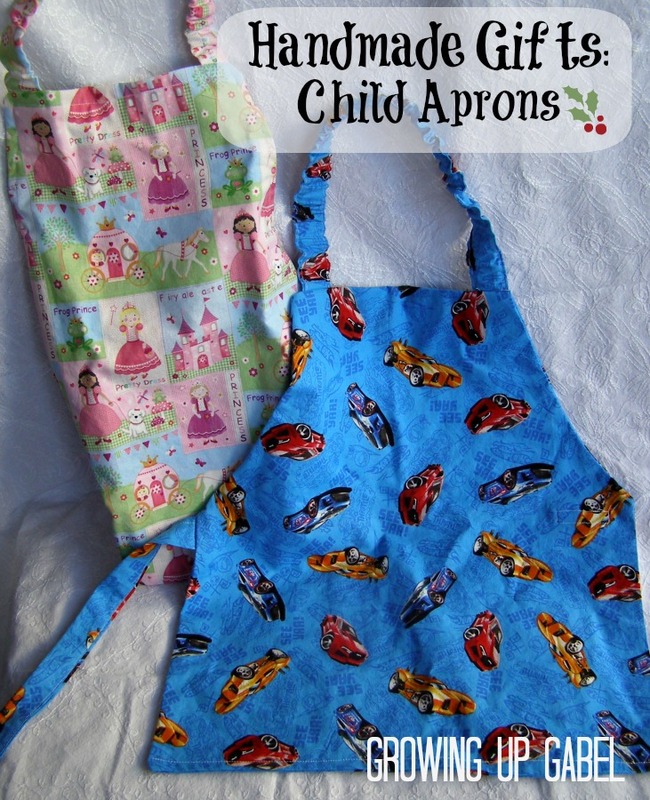 These child aprons are simple beginning sewing projects that can be used in the kitchen, at the craft table or even in the garden. The aprons are no tie so they are easy for kids to put on themselves. Last year after Christmas a college friend of mine posted a picture on Facebook of all the fabulous handmade Christmas gifts she had made for her family. I decided then that this year I would make as many handmade Christmas gifts as I could manage. Last year I did make a few handmade gifts like family memory jars and knit headbands and knit fingerless gloves. But this year I really wanted to sew more handmade Christmas gifts since they are quicker to make. I spent this past year honing my very beginner sewing skills using on-line sewing classes and tutorials. 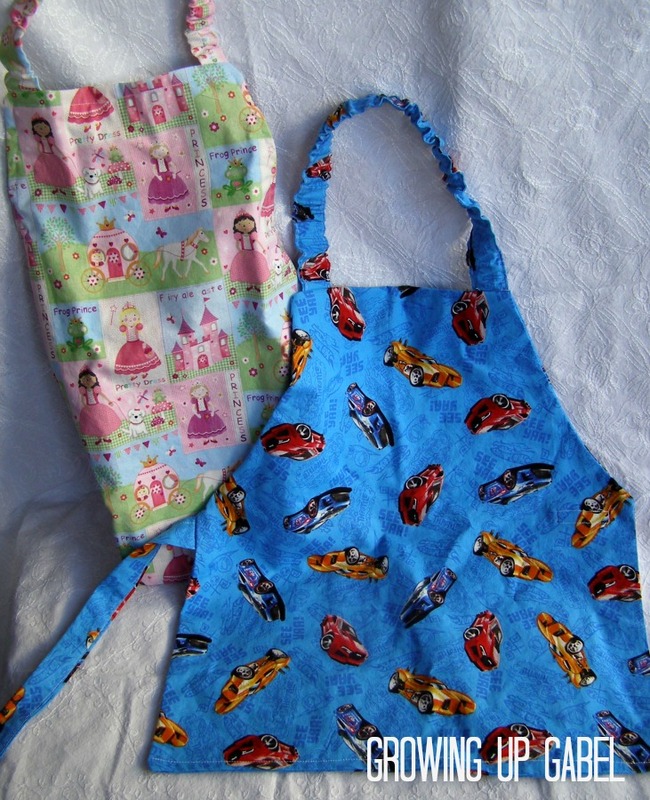 My first project in my goal to make handmade gifts were these kids aprons from Sew Liberated. The tutorial is really well written and very easy to follow. I love the fact that the Velcro waist band and elastic neck band mean that the kids put these on and off themselves. The aprons are super quick to make. I spent the most time turning the neck and waist bands right side out! I opted to just use cotton material that I already had on hand, but if I was purchasing material I'd buy duck cloth or something similarly sturdy. I did not edge stitch the car apron, but did on the princess apron and I definitely like the edge stitching. You can also add pockets and the tutorial includes instructions on how to do that. I'm really happy with the way these turned out and I hope my kids enjoy using them in both the kitchen and during arts and crafts! I’ve seen u made that child’s apron from sew liberated and I can’t seem to find it. Do u have instruction n supply list u can send me? Hi Bonnie! You can find the information here: http://sewliberated.com/free-tutorials . Under the child’s apron. These are really cute! I’ve been looking for a pattern to make one for my son. Thanks! So lovely!!! Love the fabrics! Thanks so much for sharing! Thanks for sharing this! I got a sewing machine for my birthday a couple weeks ago and I’m excited to try some beginner, projects. I’m definitely making a lot of gifts this year too! What a great project! I’m going to learn to sew in 2013 and this would make a fun first project! It would! The tutorial is very well written for beginners!